Starting to get below the red line! 265.2 lbs in today’s weigh in. I’ve been bad with the exercise regimen the last week or so it’s got to be the diet that’s causing it a little. Found out a couple of weeks ago I’m allergic to wheat, soy, chicken, and corn, and a lot of various pollen, including maple and pecan, which probably means I’m partly allergic to maple syrup as well as pecans. I don’t think they tested me for almonds but those always tore up the back of my throat so I think it may be that too. Got rid of all of that stuff from the diet over the last few days, so I think that this new eating clean diet is helping a lot. It’s a struggle daily, but it seems to be paying off already after only a few day! It’s amazing how many hidden ingredients there are with corn and soy in just about everything everywhere you look. It’s crazy to think that some of that ties in to soy allergies, but based on a lot of reading I’ve done on numerous blogs and websites the last few weeks it all ties in in various ways… the whole food industry hides stuff from you behind weird chemical names. For example, did you know that Bromine is one of the main ingredients in the vegetable oil that’s in Mt. Dew and Diet Mt. Dew… and that that stuff is actually a dangerous toxin that has put several people in the hospital over the last several years because they drank too much mt. dew and similar types of drinks with that stuff in it? Kinda scary to think about since I used to drink tons of Mt. Dew, and then diet dew after getting diagnosed with diabetes. I still might have an occasional drink, but for the most part have cut it out of my diet along with a lot of other stuff. Luckily, I don’t think I’m allergic to rice, so rice cakes and rice based cereals seem to be somewhat safe, at least at the moment. I’ve started tracking things a bit with some open office documents. I’m going to try to re-start my exercise program in the very, very near future. I probably won’t count 1000 days like I was back a while ago since that just got to be too darn tedious, but I am planning on updating the above file to reflect current weight loss. Blue Line is weigh ins that I have recorded in this blog and in more recent things in the file at home that I may not have blogged about yet. 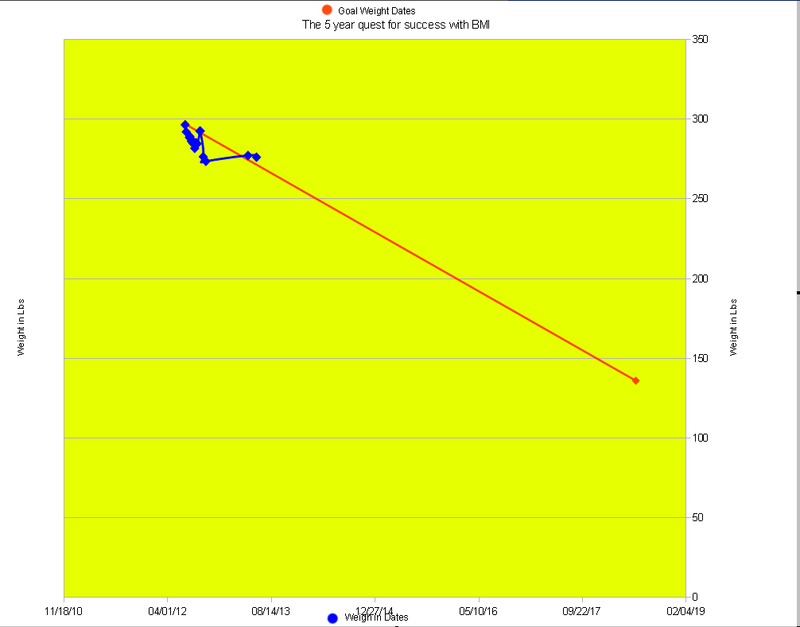 Red line is following a goal from starting out one lb above where I started this tracking to where I think a great BMI weight would be in 5 years from now. I like setting up a chart like this to track things since it’ll help me maintain a goal that is visible… I’m a highly visually oriented person so nice charts like this help me stay on focus and realize gains and losses far more powerfully than just putting it all in some other format. The reason for the red line in the chart is because of some reading I was doing the last few days on some blogs related to the NO-S diet and some tips and tricks some other folks were using or have used in the past to lose weight. One blog entry talked about a book from the 1970s or so that talked about charting your goal weight loss on pen and paper and if you go above the line you eat less or exercise more and if above you go below, give yourself a little leeway, etc. Then at night I’ll do a longer 20-30 minute or longer workout, probably using some other youtube type sources as well as various workout dvds we’ve purchased over the years (some of which only were opened a few weeks ago even though we owned them for about 3+ years already!). Power of 45. Goal with diabetics food planning and loosing weight/weight maintenance with blood sugar levels, etc = 45 carbs per meal. Please note: I take ABSOLUTELY NO RESPONSIBILITY for any of the content linked to below… I’m just linking to various videos and exercise links I’ve found online… I didn’t upload most of this stuff. If there’s some copyright violation or whatever, please don’t come knocking on my door with a court order or something like that. If you are a copyright owner and some of the stuff below is violating your rights, just leave a comment and I’ll try to delete the link as soon as I get a chance to read your comment. Here’s an awesome tip… Use Google Video search! Ryan Magin’s Youtube channel – He explores how various actors workout. Sword Workout – finally something I might be able to use to workout the crowbars besides the shovelglove stuff. Some smart tvs now can do some video streaming… but some content providers block that when they can, so results can very depending on the hardware/software and what you are trying to stream. a) Open a cmd window using the Windows run command. b) cd to the folder containing your VOB files. This will concatenate multiple VOB files into one output file. Note: Please don’t forget the /b switch. Avidemux works too… but not as well… it can rip up the area between the two avis or mp4s that are joined making screen unseeable as it’s all pixelated to hell. if it’s just avi files, windows movie maker or some cheap software like Magix Video Music maker work too. Use Bungee Cord as an exercise band? http://www.youtube.com/user/KozakSportsPerform/videos?view=0 – HasFit Video Channel on Youtube. http://www.sparkpeople.com/resource/fitness_articles.asp?id=1222 — nice info on Kettle bells. There’s also a few blogs and forums I’ve read about it lately… interesting idea… the idea is that if you overwork, you will get hurt… seems logical. Makes me think maybe my wanting to do workouts twice a day is a mistake?… Not sure on what is the most appropriate stance on that issue yet since working out this intensely is still a fairly new way of life for me. http://www.youtube.com/user/befit?feature=results_main = Be Fit Channel on Youtube has quite a few free workout videos, some even from the popular folks like Jane Fonda, Jillin Micheals, etc. Very nice treasure trove there. http://www.bodyrock.tv/ – Body Rock TV has a lot of great workouts on youtube. There’s multiple contributors to it, so various multiple channels on youtube… that’s why I’m linking to the main website… You’ll have to explore a bit yourself if you want subscriptions to all the youtube channels related to this. http://www.youtube.com/user/FreeYogaVideos?feature=watch – Learn Yoga on youtube! http://www.youtube.com/user/yogatoday – Learn even more yoga over there! Also, if you have a roku or some other way of playing video from internet on tv, both All Fitness TV channel, and Live Exercise seem pretty interesting as well as a few podcasts like Yoga Today, Hillary’s Yoga Practice Podcast, Yoga with Les, and Fit for Duty.